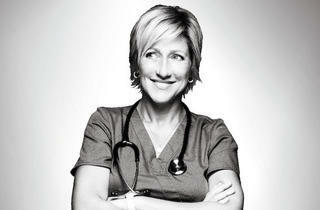 The actress diagnoses the parallels with her character, Nurse Jackie. When I inquire about her morning, Edie Falco doesn’t hesitate: “Oh, it’s madness. I’m the mother of two young kids.” It’s something her character, Jackie Peyton, might say. In fact, there are a few parallels between actress and role: Both are moms of two, both New Yorkers, both women with histories of addiction. We spoke about the connections in advance of Nurse Jackie’s fourth-season premiere April 8. The 48-year-old, who’s won one Emmy for Jackie and three for a little HBO show, says fans still call out “Carmela!” five years after The Sopranos’ finale (often, she notes, when she’s at Knicks and Rangers games). Given your history with alcohol addiction, does playing someone addicted to painkillers feel like you’re constantly having to tap into that part of your past? I’m very far away from my experience with addiction. If you’re an addict, you’re an addict, and it’s just the way your brain works, so it doesn’t really ever go away. But as far as my pull towards alcohol, that for the most part is gone, so I don’t feel, like, in danger in any way. Addiction has caused so much pain in everybody’s lives, certainly mine, but I find it endlessly fascinating, just the way our brain can be maneuvered into such irrational behavior. There’s the question of whether Jackie will ever reach the turning point. When did you? The day I stopped, a very specific day in my life where I thought, Oh, I’m done; this is something that is having me rather than me having it. It was the morning after an absolutely awful night when I woke up in an awful state, and some very calm realization came over me that I’m never going to do this again. And that was literally 20 years ago. Paul Schulze, who plays the pharmacist, took you to your first AA meeting? Yeah, one of my oldest friends in the world. Most of my dear friends are sober, and they were the first ones to get sober, and I saw how beautifully their lives were going, and these were all actors I still know and work with. The world gets very small after a while, if you stick around long enough. One of the series’ producers said one thing that distinguishes this from other medical shows, like House, is that the protagonist is a woman. Do you think that makes a difference? I’m terrible at knowing these things. Throughout my career I’ve played a lot of parts that might’ve been played by a man. They’re human roles rather than specifically men or women. I’ve never been as hooked into that as a lot of women are, you know, like, “There aren’t enough roles for women.” There aren’t necessarily a lot of good roles for anybody. I wonder if that’s also about you: You’re not a wilting-flower girly girl. I’m sure that has something to do with the stuff I’ve chosen to do ’cause it more accurately reflects the person I’ve always been. I grew up kind of a tomboy and I used to fight with all the neighborhood boys. [Laughs] I’m not really interested in Desperate Housewives. That’s not a role I understand or can even relate to. The show presents an unusual depiction of a mother: She loves her kids but isn’t wholly defined by them. As a single mom of two kids yourself, what do you make of that? We’re living in a time when parenting is not at all mirroring the way I was parented. For me, I just followed my parents around on their errands; when they were busy on the phone, I was quiet. It’s a different kettle of fish these days: They run the house, and you listen to their music, and you go to their appointments. That’s frankly not the way I do things in my house. I also had a pediatrician who said, “They have to fit into your life, not the other way around.” That is my parenting style. I look at my kids now and I am blown away by the people they’re becoming, so this is working for me. You’ve said you realized you didn’t need to be in a relationship to adopt and become a mom. Did being the kid of divorced parents in Long Island inform that? Not just my parents—everybody I knew and everybody I know now either is divorced or comes from divorce, and the only thing I know that I can promise my kids is that I will always be there. I cannot promise them that if I was married that me and your dad will always be there together. 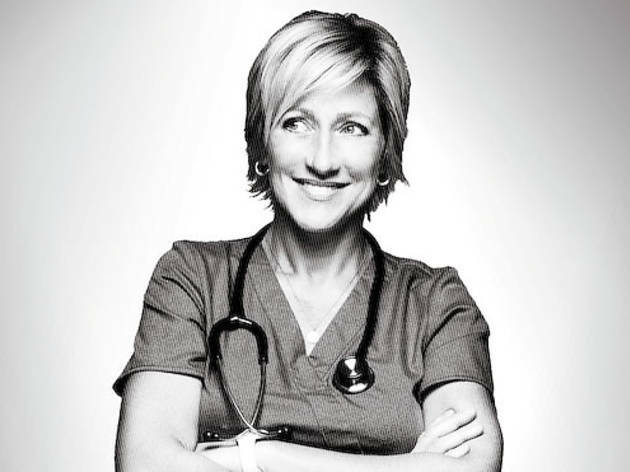 Nurse Jackie adheres to the idea that doctors provide treatment, nurses provide care. Did you see that when you had breast cancer several years ago? I guess so, although it’s hard to use my experience as representative because I came at this as someone who had been on a television show, so the attention I got was so different from what the average person got. There’s always a little piece of me that feels a little bit guilty. Everybody needs that special care that I got. My sister kept saying, “Just take it. Don’t fight this. Don’t get all intellectual. Just take what they’re giving you.” It was not always easy for me ’cause I’ve been the other person far longer than I’ve been a person on a television show. What’re you saying, celebrities get preferential treatment? You kidding me? In every place. It’s all fantastic, but it’s conflicting. It’s confusing a little bit. Nurse Jackie’s season premiere airs April 8 at 8pm on Showtime.